Some of my coaching clients are solopreneurs and small businesses. And some of them contemplate using a newsletter (aka eZine) like I do to keep in touch. I always gently warn them about the realities of this medium. If you are going to employ it, you gotta publish on a regular, reliable basis. And that can sometimes mean putting in extra hours to an already long week in order to hit your publishing date. I've had one of those kinds of weeks ... and I'm writing when I'd rather be taking a nap! We had a great course launch this week ... Fundamentals of Working Visually. A switchover for a few courses into our new SHIFT-IT School site. A revamp of one of Visual Coach Certification (finally refreshed the info page on that intriguing program ... more in today's article). Tomorrow I close out our 15 session run of Practical Energy Work (so delighted with our maiden voyage, will do again next fall for sure). And, to top it all off I helped facilitate the Annual General Meeting of my condo association. Working visually is very versatile ... we have a cedar siding issue that I needed to share the back story and options on, so a quick little whiteboard scribing did the trick, was fun to introduce my neighbors a bit to what I do for a living. I was going to write a blog post about the enhancements to Visual Coach Certification and do a different article for the eZine. But well, there are only so many hours in the day so I'm having to combine the two. Sorry for those of you who aren't interested in this application of the visual work. However for those of you who are, we have some interesting enhancements (including 13 more maps ... making it a total of 30 Visual Maps included now). Plus a new course added to the Combo Package to sweeten the deal (grandfathering allowed if you already have). MY MIND WAS BLOWN. 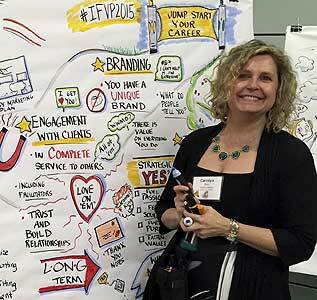 INSTANTLY, GRAPHIC RECORDING AND FACILITATION MOVED TO THE FOREFRONT OF MY BUSINESS AND I HAVEN'T STOPPED DOING SINCE. "I had been an admirer of Christina's work for many years and was immediately drawn to it. Yet I constantly rejected the idea that I could learn to do such a thing as graphic recording. I couldn't draw. I wasn't artistic. Could I really earn a living drawing with markers? In the spring of 2014 I decided to give myself the gift of taking "Fundamentals of Working Visually". I had no agenda or intention it would have anything to do with my business as a strategy consultant for small business owners. As soon as I got started in Christina's workshop, my mind was blown. 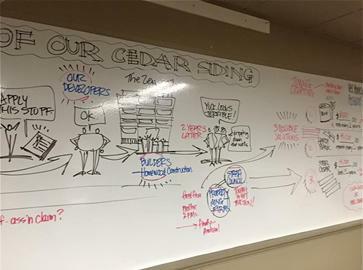 Instantly, graphic recording and facilitation moved to the forefront of my business and I haven't stopped doing it since. 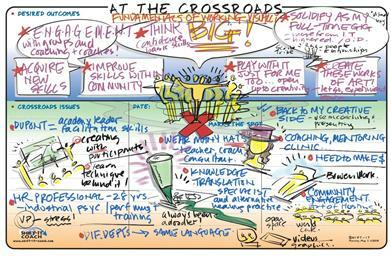 From creating sketch notes for a global virtual summit on awakening to your purpose featuring world-renowned business and spiritual leaders to large-scale business trainings with over 2,500 people in the room, I have been delighted to see what this way of working visually has done for my clients, but also for me and my business. Opportunities to work with inspiring clients doing meaningful work are finding me. Word of mouth referrals flow in regularly. Through this work I've connected with fantastic colleagues, wonderful clients, and I am grateful on a daily basis to have found it. Christina is an exceptional trainer. She creates such an encouraging environment for people to learn. She's so experienced, clear and encouraging, you can't help but want to stretch your wings and jump in when she's there by your side. I feel incredibly inspired and joyful doing it and am so grateful I chose Christina to be my first teacher. Under her guidance, I felt like I had found my true calling where I could use my intuition, my listening and awareness skills, and my Harvard-trained brain to help my clients solve problems in a powerful and creative way. 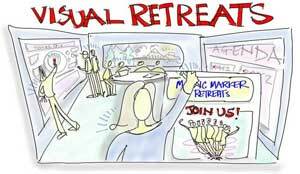 I'm ready to take my Graphic Recording skills to the next level, so just signed up for her Magic Marker Retreat ... a clear next step for me!" 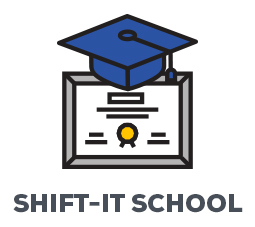 SHIFT-IT School continues after your course ends. As a valuable bonus to our grads, we offer complementary online communities. Includes 24/7 forums and monthly drop-in webinars. Dates Announcement Coming Soon ... Stay Tuned! Note to Grads: Contact [email protected] to join. For coaches, counselors, therapists and others who work deeply with individuals. 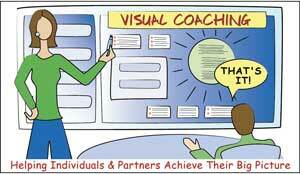 Add the power and innovation of Visual Coaching to your professional practice. Includes advanced Visual Coaching techniques, use of my SHIFT-IT System® with your clientele (17 visual maps), guidance in the 'template-izing' of your own intellectual property, plus marketing and biz development support. Two Pre-requisites: SHIFT-IT Online and Fundamentals of Interactive-Visuals (or equivalent experience). This professional skills training (fully online) thoroughly covers the four main ways of working visually: Studio Work, Graphic Recording, Graphic Facilitation and Graphic Coaching. Over 87% of your consulting, facilitation, training, teaching and coaching clients are Visual Thinkers - these powerful visual skills boost the effectiveness of how you work with groups and/or individuals. This is the online version of my popular fundamentals training (no travel required). Attracts folks from across the English-speaking world - your Visual Tribe! Fully recorded, if you miss classes or want to watch at a time more convenient for you. Note: Pre-requisite for Visual Coach Certification. FYI, Repeater Option available on Feb. class for those who have taken before and want to repeat as a guest (write us for coupon code). Getting your visual basics is half the equation - the other is competency and creation of a viable practice (whether you are internal or independent). This 2-day Boot Camp takes your visual practice to the next level: chock full of at-the-wall drills, project brainstorming (bring work for feedback and ideas), and identity/brand/financial coaching. Work your brain, your fingers and dissolve your resistance, all in deep community with Visual Practitioners. Note: Pre-requisite is Fundamentals of Working Visually (or equivalent experience). Each Magic Marker Retreat is a unique experience, come as many times as you like for continued inspiration and development! To Listen Or Download Mp3 Version of This Article, Click Here. Using visuals and other powerful techniques in process work with individuals, partners and couples is one of the greatest joys of my life. 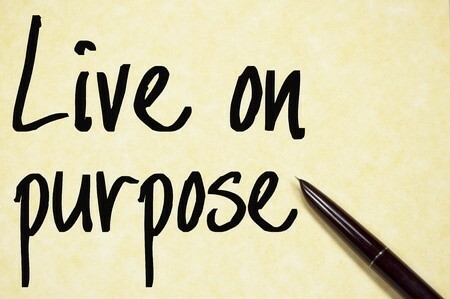 If we each come into life with a purpose, then at least part of mine has been to help pioneer Visual Coaching in the world. 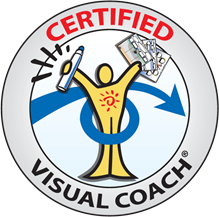 The very first year that I offered Visual Coach Certification® was 2010 and it was open to just my immediate client base (folks who had been involved or observing my pioneering experimentations with Visual Coaching). The impetus for the program came from those very same clients ... they were experiencing such significant changes from Visual Coaching and SHIFT-IT, that they wanted me to explain in more depth the magic behind it all, and empower them to use my methods and tools with their own client base (as many were Process Professionals who worked with individuals too). So, I did that ... Visual Coach Certification was born. Over the past six years many additional innovations and advancements have occurred. So this year, I've enhanced the program, to make it even more useful to you. The base of this program has always been the 17 Visual Maps contained in my SHIFT-IT System®. There are maps for historical work, for current day analysis, for future visioning, for resistance / energy alignment. And, for broad and detailed planning. They work together as one comprehensive process, or separately depending on how you like to work. For a fuller explanation of this cohesive process and its detachable moves, click here. I've now added 13 more maps, bringing the total maps included to 30. The new maps include more visioning tools, more law of attraction tools (energy alignment), a powerful orphan rescue protocol (a soul retrieval technique that I use constantly in my own practice) as well as a basic map to assist with ongoing implementation with your regular clients. SHIFT-IT Coach, Inc. is a boutique training and coaching company specializing in visual and energetic process work for groups and individuals. Founded by Christina Merkley, pioneering Visual Facilitator and Coach, she works deeply with individuals, partners and conscious businesses to define and manifest what you really want. Christina also trains Process Professionals from across the globe in her innovative ways of working. For more information visit www.shift-it-coach.com and www.visualcoaches.com. Click here to read The SHIFT-IT Blog. Listen to the eZine here. Copyright © 2004-2016 Christina L. Merkley. All rights reserved.